In case you have yet to come across the tragic tale of how one Luo Han fish met its untimely demise at the hands of a careless maid, here it is. 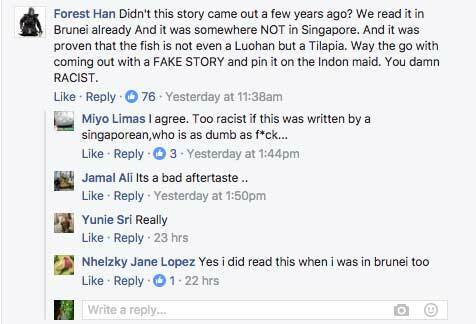 First published on the local site All Singapore Stuff yesterday morning (Dec 27), the short post shared how one owner had come home to find that his pet Luo Han fish had been fried and served up for dinner. The post immediately went viral on social media, with more than 22,000 likes, shares and comments as local netizens banded together to express a collective sigh of pity at the loss of one of the most valuable species of fish in Singapore. 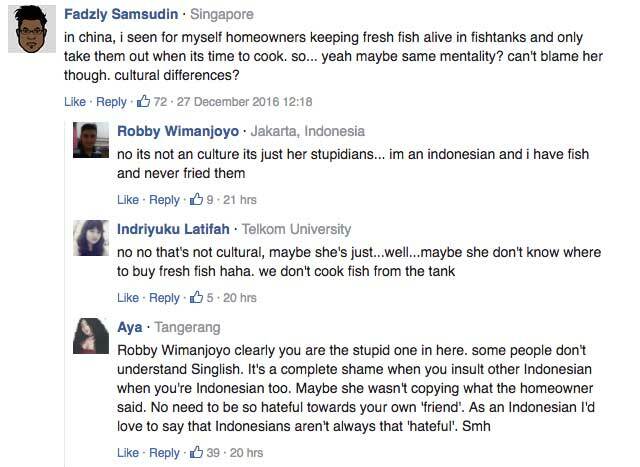 While some netizens took the side of the domestic maid with encouraging statements on how it was simply an honest mistake, others were a lot less tolerant, inciting remarks that border on racism. But if you had been paying close attention to the comments in the original All Singapore Stuff's Facebook post, you would notice that some observant individuals were calling it out as fake news. When the post was shared by MGAG this afternoon (Dec 28), it was quickly followed by a complete debunking by one Javier Loke, who proceeded to break down exactly how fake news could be engineered. A simple Google search of the fried pet fish also landed me at the Instagram of one Vi Sick, where the photo had been posted 35 weeks ago. In the comments section, he also admits that he had snagged the photo from the Internet. While these sort of stories may not appear of much consequence, it does reflect a worrying issue - that it is way too easy to lead people by the nose with a crude cobbling together of fake news. Given the slew of fake news fiascos that marred the course of the US elections, the problem is that fake news can appear to the general public as just another way to undermine politicians, until it escalates into a shooting that endangers real human lives. Fortunately, Singapore has yet to see its fake news scandals breaking out into chaos, but this does not mean that we are immune to potential fear-mongering topics, or in this case, hate-mongering ones. If anything sounds fishy or too far-fetched to be true, it probably is.